2001: A Space Odyssey is an amazing movie that although made 50 years ago still holds up incredibly. And the technology that was foretold for 2001 in some cases was spot on. And there was this infamous flatware. 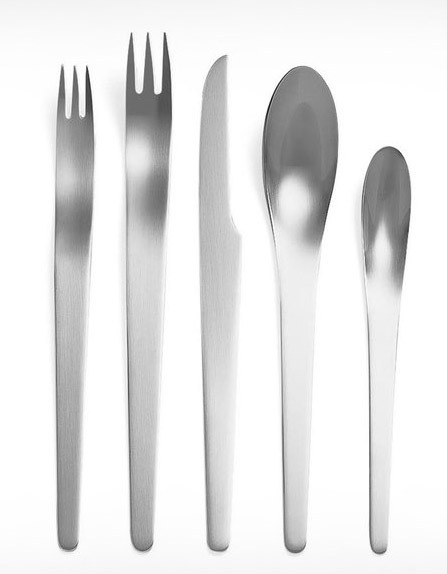 Danish designer Arne Jacobsen for Georg Jensen created this five-piece cutlery made of 18/8 stainless steel with a matte finish and consists of a pastry fork, dinner fork, dinner knife, dinner spoon, and teaspoon. Be warned that this is more of a prop than made for regular table use, unless you are in space then have at it.